Do you want to work in a harmonious organization with motivated employees, while also getting fewer complaints from customers? You can take the culture of your organization to a higher level by enrolling with a training course on FISH! the Organisational Culture with PD Training. Now available throughout Hong Kong, this FISH! Organisational Culture training course can be delivered by our expert local or international trainers at your chosen venue and schedule. The FISH! 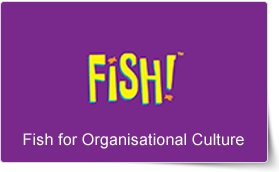 for Organisational Cultures training course is a one-day workshop that empowers all your teams to embrace the FISH! Philosophy and build a highly effective customer service culture across all departments within your organization. By allowing your staff to attend the course, you will begin the process of building a high-performance customer service culture across all your teams.